Tofu is one of those things that can be really amazing or really bland and there is no in-between. My hubs thought he hated tofu because the first few times he had it it was mushy, flavorless and did nothing to enhance the meal. I blame myself. I didn’t realize that the spongy texture could be enhanced and just assumed that tofu was supposed to taste like mush. Then we had a decent tofu experience at a restaurant and decided he may not mind it after all. The tofu was fried and delicious, the only problem was that it was huge. It was cut in a triangular shape and the fried part was outweighed with the spongy texture and that’s why it was only a decent experience. The fried crispy layer was outweighed with the sponge mushy layer! I found out from a friend that the restaurant did not fry the tofu themselves, they bought it from the store already fried (you can get this at specialty stores) and then just recook it with their sauce mixture. When I asked people how to fry the tofu myself, no one could give me an answer. Of course the town I live in currently doesn’t have stores that sell fried tofu and I would need to drive an hour to buy it. 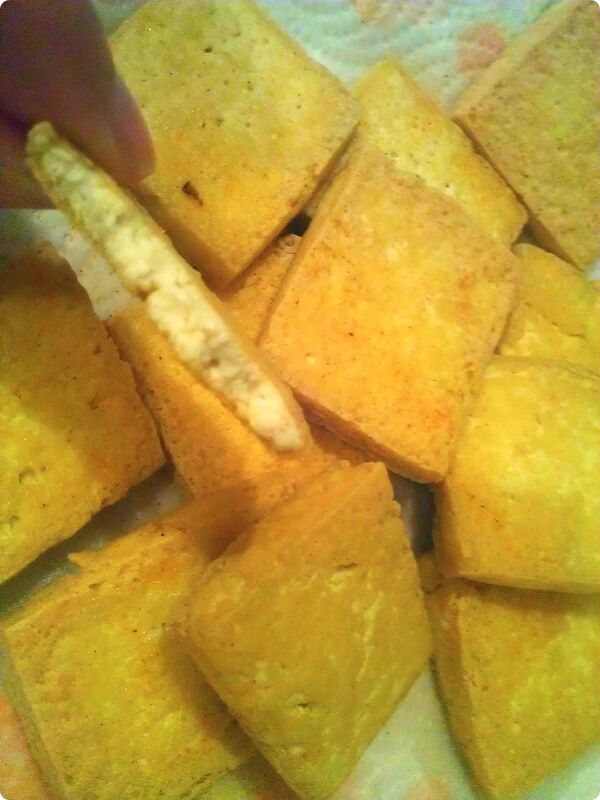 The challenge was accepted: I would make my own fried tofu. I Googled how to fry tofu and after reading multiple recipes and reviews I decided to try it this way. 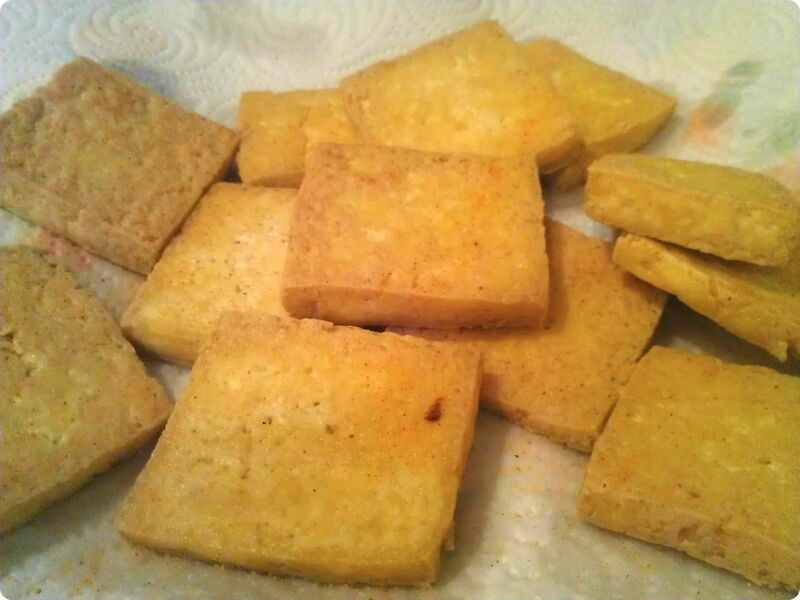 This tofu isn’t fried in the traditional sense because a lot of oil is not needed. This is a tasty and simple way to eat tofu and it goes great in other dishes like a sweet and tangy Asian inspired meal, (which I will post in the near future) as well as on sandwiches. Drain the package of tofu and thinly slice the tofu long ways and then cut in half. You want even tofu squares. Now place in a bowl of hot salted water. Leave in water for 20-30 minutes. After 20-30 minutes drain water and lay tofu on a clean towel. Place another clean towel on top and press with hands. Basically you are trying to drain the remaining moisture from the tofu. Heat a cast iron skillet or flat cast iron griddle (I prefer the griddle because it can cook more at once) on high heat with the oil. Carefully place the tofu in and allow to cook on one side until golden (about 3-5 minutes), flip and allow the other side to cook until golden (about 3-5 minutes). After it is finished cooking remove from heat and place on a plate with a paper towel (so the excess oil can drain). Lightly salt and enjoy! I like to press dry and then marinate in one of my favorite sauces (BBQ, Teriyaki, etc…) it flavors the tofu and makes it very tasty and an excellent compliment to rice. Any of the store bought sauces/marinades work well with tofu as it absorbs the flavor. If you find that you like tofu, investing in a tofu press like the EZ Tofu Press will make pressing fast and easy! You can get info at http://www.eztofupress.com, works great! You can press tofu in 10-15 minutes and throw in dishwasher or just rinse off. Saves on paper towels and stacking cans in dangerous patterns!